The property has recently been renovated to a high standard throughout and is situated in a highly sought-after location. Rich original features and all the comfortable life.Please feel free to contact our consultant. 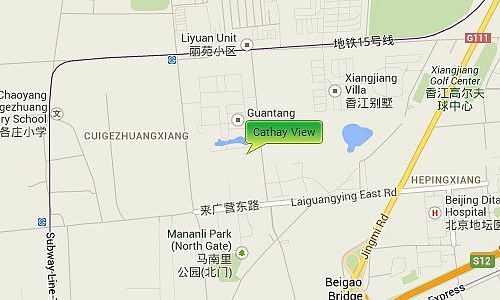 Cathay View is located on the Jing Shun Road close to the Western Academy of Beijing. To the east is the Wenyu River and south is the Airport Expressway Bei Gao exit, giving resident’s easy access to both the Airport and to Central Beijing. It is also near to the pinnacle plaza and euro village where you have a range of shops, supermarkets, restaurants, cafes. Banks etc.